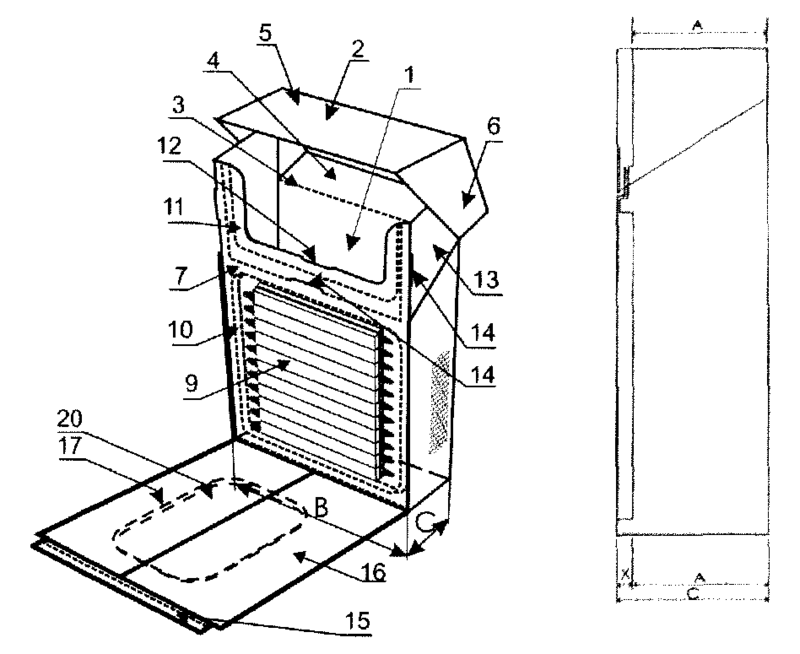 Description: A cigarette box, of a rectangular prism shape, formed of a storage part adapted to accommodate cigarettes within and a hinged lid connected with the said storage part by means of an articulated joint placed on the rear wall. The front wall of the lid is longer than its rear wall, and the side walls are oblique. The storage part, is provided with an additional inside front wall (7) and the outside front wall (8) of the storage part is hinged. Between the hinged front wall (8) and the inside front wall (Z) there is an additional compartment useful for matches (9), lighters or other objects. The inside front wall (7) has two extrusion ridges (10, 11) oriented towards the box interior, where the lower extrusion ridge forms the storage space. The outside front wall is made of the same substance as the box and may feature an extrusion ridge (17) oriented towards the outside, which would form an additional storage space.